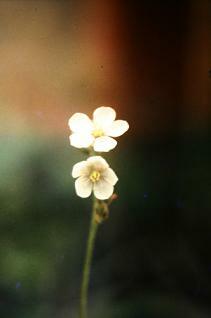 The pale flowered form varies from white to pale pink flowered. The rosettes also vary in colour, the paler yellowish green rosettes have white flowers, the darker ones are usually pink. An almost white flower from the paler end of the range. 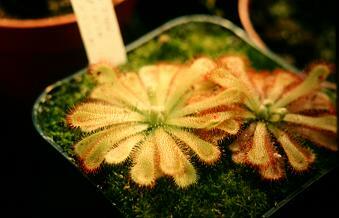 This strain showed a lot of variability when photographed here in 1980, but Drosera aliciae usually self pollinates, which tends to reduce variability over the years. I have not seen the strain recently, but would expect it to be quite uniform now.